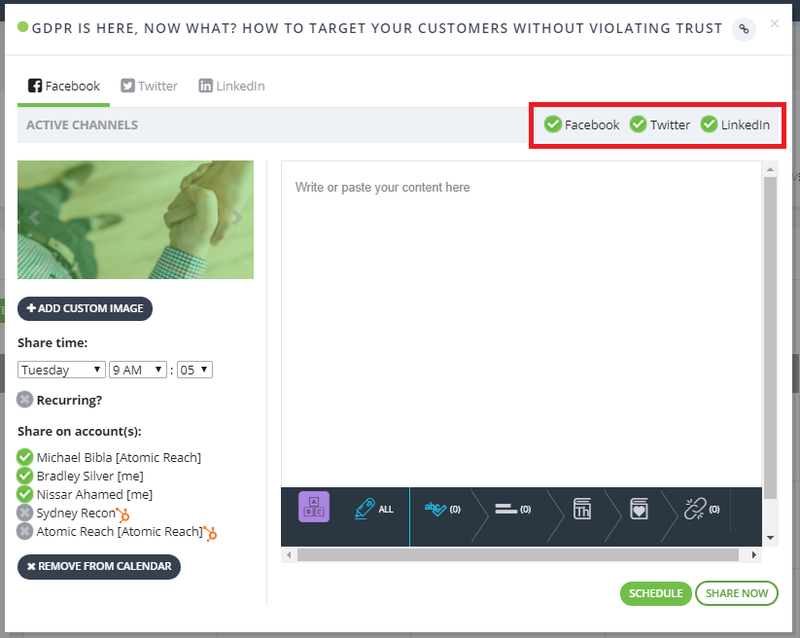 (Original Platform) How do I create an article for social sharing? Share is the all-in-one smart social scheduling tool packed in a clean calendar interface. You can create original social shares, share your articles, and curate interesting content to your followers. It also includes a slim version of the Create editor to make sure you can create great content anywhere. Curate an article from the web. Step 1. Click on the Curate Article button or directly on a time slot in the calendar and choose the Curate Article option. Step 2. Paste the article URL and press Assess. Step 3. 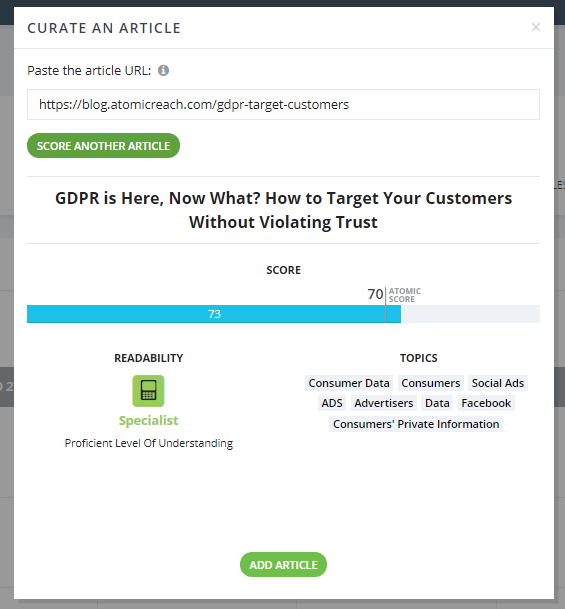 Atomic Reach scores the article and gives you its readability and main topics, you can use this as a guideline to see if the article is suitable for sharing with your audience. Tip: The feedback is aimed at articles, if you are simply sharing a web page to a promotion for example, you can safely ignore the feedback. Step 4. In the pop-up, select the social networks you would like to share your article to. Step 5. Attach any images. Tip: We will try to grab the images from the URL. Step 6. Double check the correct time and social accounts are selected. Step 7. Add in the accompanying comment for each social network. Enjoy a slim version of the same editor from Create to help you craft the perfect comment. Step 8. You can share the article to your network immediately via the Share Now button or schedule it into your calendar for the selected time in Step 5 via the Schedule button. If you have any questions, feature requests, or would like a demo of our Share module, please reach out to support@atomicreach.com and we'd be happy to help you.